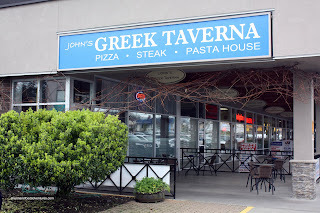 I'm not even sure how we ended up at John's Greek Taverna today. I think we were looking for a completely different restaurant and since we were running short on time, it was close enough. If we didn't pull into the parking lot accidentally, we would've never known that this place even existed. There are a whole bunch of businesses hidden from the main thoroughfares. In fact, there are a few other restaurants too. Nice. Now in addition to my random wanderings in Surrey, I will now pull into random parking lots and circle around looking for hidden restaurants. Yah, that's a past time that is both a bit strange and might draw the attention of the authorities. Hey, it's not a stretch. Happened before! Not to worry this time around since the cop shop is literally next door to this place. They can watch me from their desks if they like. Since we were pressed for time, we quickly ordered and amused ourselves with the fake fire above our heads (it was blowing tissue paper emulating fire). We started with the Calamari and it was a pretty large portion. Despite being crispy and not too oily, there was too much batter. It completely overwhelm ed the pieces of squid. The tzatziki was alright, could've used more lemon. For my main, I had my favourite which is the Roast Lamb. Honestly, I was torn on this one. I don't want to be mean; but this dish was horrible. There is no other way to describe it. 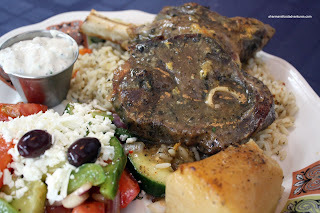 Yes, there were 2 generous pieces of lamb on the plate. But both were tough, hard, stringy and salty. I really didn't enjoy it and had to stop eating it. It wasn't all bad though. I did like the fresh Greek Salad and the rice was alright. The potato was okay as well, it could've used a bit more flavour though. Curiously, Father D chose a dish that was not very Greek. He w as craving steak and went for the Steak Sandwich. And believe it or not, it was pretty darn good. As you can see, the meat is nicely charred and it was cooked as requested (medium-rare). 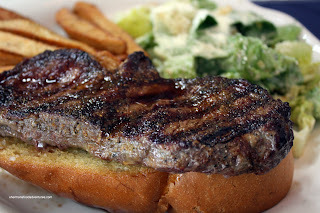 It was served on a nice piece of garlic toast and the accompanying Caesar Salad was solid. As for the fries, they were forgettable being fried a bit too long. 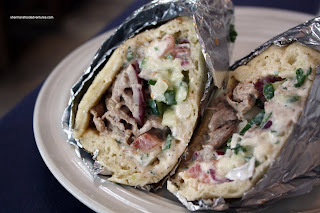 You'd think a steak sandwich would be filing enough for lunch; but Father D also had a Beef Gyro! It was good as well. Packed with plenty of fresh ingredients and beef, this one was a winner. So, 2 out of 4 dishes were good. The one dish I'd hope to be good was in fact, terrible. I'm not sure if that was a one-time mistake with the lamb or not. I seriously hope that it was a off-day since that would be embarrassing for any Greek restaurant. Again, this made it tough for me. I didn't want to be harsh, especially given the really good service we got as well. But... the lamb was that bad. Until I try it again, for now, I would take a pass. 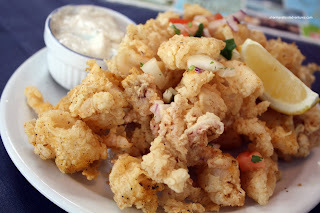 i have a love-hate relationship with calamari. i love eating it but my stomach hates it. i find pacing myself with it impossible though - i have to eat the whole plate! unless it's stepho's because that's borderline impossible. Calamari when done right is so good. Done wrong, and it's pretty gross... Stepho's is huge! Oh man.. i wish I read your post before we went the other day. I agree the roast lamb was really bad. Though I finished it, it didn't satisfy my craving at all. Your review is basically the same a year later.